--Musicality that isn't caught up in genre, a grand worldview that envelops the entire album. 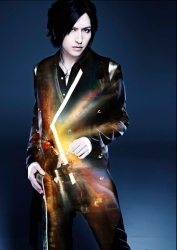 This album, appropriately named "9," really shows off the special qualities of Alice Nine. What are your thoughts on it? Shou (vocals): We're a band that's turned our hands to various genres since the beginning. We didn't go through that stage where we're a new band trying things out; we hit upon a sound that we liked on our previous album, "GEMINI," and "VANDALIZE" before it. On "9" it feels like we're returning to the standard Alice Nine, but we're taking advantage of the challenges we've experienced to give the sound a persuasive power. I think this is the album where we loudly proclaim, "This is who we are as a band." Hiroto (guitar): I think some people will have the impression that we took the theme from "GEMINI" and expanded on it in this album, but I think instead we just opened up to our we current situation without thinking about it too hard. Of course there were many different challenges, but I think that we were able to cram in as much as suits us as a band. Saga (bass): The scale of it arose organically. We weren't planning for it to come out that way; you could say that it was idiosyncratic. --What you've accumulated a lot up to this point. Why do you think you've been able to able to achieve this naturally? Sh: Hmm... Well, back in January of last year we were able to have a solo live at the Budoukan. I don't think that we were able to do that on our own; it reaffirms our ties to our fans and our staff, and re-focuses our feelings for them. Also, because we were able to release an album like "GEMINI." Broadly speaking, I think those two things gave us the confidence. It didn't feel like we needed to do the impossible to show who we are. You can't really call us "no good"
--So you're saying that, as a result, you were able to bluntly express the musicality you inherently possess. Sa: We don't "inherently possess" that musicality. It's not like we formed the band just because we all take a particular interest in music; the musicality arose as we worked. You can't really call us "no good." For example, if a band suddenly found themselves with a metal song because of a clashing chord, that would be no good. --So you're saying that, as a band, those kind of situations don't happen to you. Sa: Not quite. It's that none of our members are overly formal or strict, and no matter what song we write, there's a certain atmosphere to it. Because we like all kinds of music. We like metal, we like J-pop and popular songs, and we also listen to ambient. H: And we'll keep listening to them. Sa: But we make plenty of mistakes. (laugh) There's no such thing as a band that's good at everything; everyone's a little clumsy. Sh: So if there are unexpected bits, we have to smooth them out. Sa: It's not our genre that's cool, there's a coolness to the music itself. Something like that. --Has anyone outside the band ever said, "Wouldn't it be better to have a process that's easier to understand?" Sh: No, we've never heard that. People have asked if it's hard to change to all of our different tunings during lives. --You do have a lot of songs that require unusual tuning. H: Yeah. (laugh) We have like five different kinds, don't we? H: I've noticed that, but it still takes a lot of time. It really takes us out of our way. --You worked with Okano Hajime to produce this album, as you did with your previous album "GEMINI." You've worked with other producers on singles, so what made you decide to work with Okano again? Sh: He challenged us when we were working on "GEMINI." We thought it was really good. When when we got together before working on this album, we said, "We want to work with Okano again." H: He's very close to us. We have the sense that he's crafting the sound together with us. Sa: It's because he isn't limited by genre; he persues new sounds. He thinks big and is diligent about a lot of different things rather than only concerning himself with performances or minor phrasing. He can look at a troublesome spot and say, ''Let's think about it more simply,'' but on the other hand he can also see the places that we need to look at more closely. --I see. Now let's look at some of the songs. The intro of the first track, ''Heavenly Tale,'' has a mood that draws the listener into a colorful music world. Saga , you composed it; did you realize that this would be the opening of the album? Sa: I did. When were putting the album together, we each thought about what we should do for the opening and closing tacks. After we'd locked that down, we planned out what to put right in the middle. Sh: When it came time to figure out the album and how it would relate to a setlist, Saga took the initiative. That way everyone could contribute ideas together freely. --The album is bursting with compositional power. 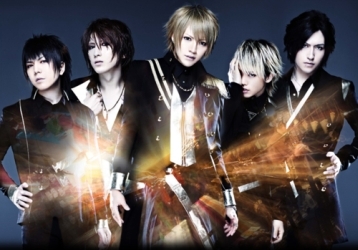 Saga also composed the second song, [''the Arc''], which is a very ''metallic'' number. You've never really had song like this before. H: But this song has the number one feeling that Saga was trying to avoid. --So then why did you form Alice Nine? Sa: That was the result of doing a lot of different things. We wanted to try and spread our wings, but weren't sure if we could. Sh: I totally agree with what Saga just said, but it's also because the music from the RPGs we played as kids was really metal. H: It was just 8- or 16-bit music, but we wanted it to be metal if we played it as a band. Sh: We still remember that we thought that kind of music was cool. We remember it very clearly. H: I think there must have been a lot of people creating games who listened to hard rock and heavy metal. Sa: We really wanted to meet Itoken. * We think he's a genius. 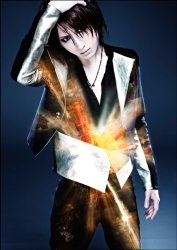 --Shou's lyrics in ''GALLOWS'' are unforgettable. The title references the place where a person is hung; is that the meaning you were going for? Sh: Yes. It's meant to act as a memento mori [''reminder of death''], to make people aware of the end and to show them that the current moment is shining. Even though that's a feeling that you get a lot during your regular life. We really wanted to convey that strongly, hence the title. --Considering the world that we live in now, there must be a lot of listeners that have a strong reaction to that message. Sh: Yeah, we had that feeling. Of course there's a negative aspect to it, but we wanted to say that you have to face the positive aspects as well. --I think that Hiroto's song, ''Hanagasumi,'' also expresses the point of the album. The atmosphere changes in this song, and there are a lot of different emotions condensed into it. H: When we went on our ''GEMINI'' tour, I really felt like the live was all-encompassing. A lot happened; there were really fun moments, but there were also people who had these hopeless looks on their faces. It felt like everything was very profound. I wanted to try and convey it all in one song, and this is that song. Sh: There's a strong sense of urgency at the beginning, but gradually the song is covered in a dazzling light. We tried to imbue the lyrics with that feeling. H: There was a moment during the live when I thought of Shou's voice urgently singing "Oh!" Bitter, but piercing... That also influenced this song. --Now we have to speak about the biggest shock of the album, "Hello, World." That is say, I was surprised by Saga's poetry reading. --(laugh) Was poetry reading an interest of yours from before the band formed? Sa: When I became interested in starting a band, there was this song, "Gasutoronjyaa." Sa: I saw them on TV, and I realized that [you can put poetry into music]. Or maybe I remembered it. Afterwards, I saw Sano Motoharu do this on an NHK show called "The Songwriters." --Oh, an unexpected name. He worked on the lyrics with Shou, didn't he? Sh: He wrote the lyrics in concert with Saga. It's touching that they encapsualted the idea of the music with straightforward and sincere lyrics, and they wrote the lyrics by focusing on that attitude. --That's also new for the band. Incidentally, what do you see for the live performances of this song? Sa: I see something unexpected. The other members will probably be like, "Huh?" Sa: We're going to start rehearsal for a tour after this, but, well, I think we'll do it the same way as our other songs. While we're scheming, we're always thinking about having fun. Sh: No matter what kind of announcement we make, we'll always have fun with it. --"Linear" also seems like a song that would look good live. --There was a sense of freedom? H: Yeah. (laugh) We wanted to create a song that we could just run with. Afterwards, we became aware of the influence from our early career. When we first got together, we just made songs with a lot of energy, without knowing what we were doing. Lately we've had the feeling that we don't do that anymore. --While you're influenced by the knowledge and skill that you've acquired through experience, you've come back around to the band's starting point. I think you can say that about the entirety of "9." The album's last song, "Subete He," also seems like it'll become an essential in the Alice Nine discography. Sa: I wanted "Subete He" to be the kind of song that, if someone asks what kind of band Alice Nine is, people would be able to point to it's live performance as representative of our work. Although we've had songs like this in the past, and while I think that's important, we want to constantly improve. Even though you can see that we're a band that's been active for a long time, we want to follow the example of bands that constantly improve by destroying our old sound, in a good way. --The title "Subete He" ["Into Everything"] has the appropriate breath for a song like that. Sh: It does. From the intro to the ending, you can see the life of all mankind. It has a philosophical viewpoint that's expressed in the lyrics. We also felt very strongly that we wanted to convey a sense of gratitude. We also envisioned the scenery of a live, and the faces of those who listen to our music and are influenced by us. --Since this album also accompanies a nationwide tour, it must hold special meaning to you. Sa: There were a lot of things to think about, but we wanted it to be the kind of tour where, if you saw everything, each thing would have its own aftertaste. Because seeing both spring and autumn is boring if you see them at the same time. H: It's fun. In the past we didn't have a lot of lives, and until now we haven't really expressed a tour on an album. We've always wanted to have an album that says, "This is everything we have; there is no more." Sh: At a time like this people can choose either joy or sorrow, and first and foremost we want to bring happiness to those who have chosen Alice Nine. Of course, you can feel that most immediately in our lives. And like Hiroto said, we want to give it all we've got. *Ito Kenji. He has been a prolific creator of video game music since the 1990s.